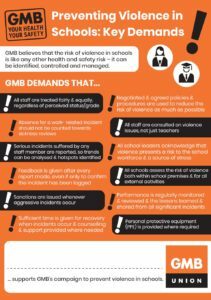 GMB believes that the risk of violence in schools is like any other health and safety risk – it can be identified, controlled and managed. A survey of school based staff over the past 18 months has highlighted that many of our members often face aggressive or violent behaviour from both children and parents. After speaking with Sandwell Council, we are pleased that Councillors support our call and have contacted all schools and academies in Sandwell prior to the end of term, encouraging them to sign up to these demands. When you return to work in September, speak to your Headteacher and ask if they are supporting GMB’s call for protection and let us know their response. We will be happy to visit schools to talk about the importance of these demands and ensure that our members are protected at work.